Specifications: Heavy Duty, channel construction designed for durability. Easy to Clean. Air baffle and circulating air blower provide even heat distribution. 5" polyurethane plate casters for easy maneuverability and stability. Two locking casters in front. Easy dual proof/heat control: "Proof" mode: Humidity from 30% to 95%. Temperatures up to 115 F (46 C). "Heat" mode: Nominal Temperatures up to 180 F (82 C). Clear door, extruded, anodized aluminum frame will not dull. A tight fit gasket is installed on inside door frame, held closed with magnets, Lexan fits tightly into door frame. Door lifts off for easy cleaning and accessibility. Control drawer is removable for quick and easy cleaning and maintenance. All controls are accessible without opening cabinet door. Easy to read LED thermometer. Electrical specifications:120 Volt-60 Cycle A.C. 1440 Watts: 14.0 AMPS - Plug into any standard 110 outlet. 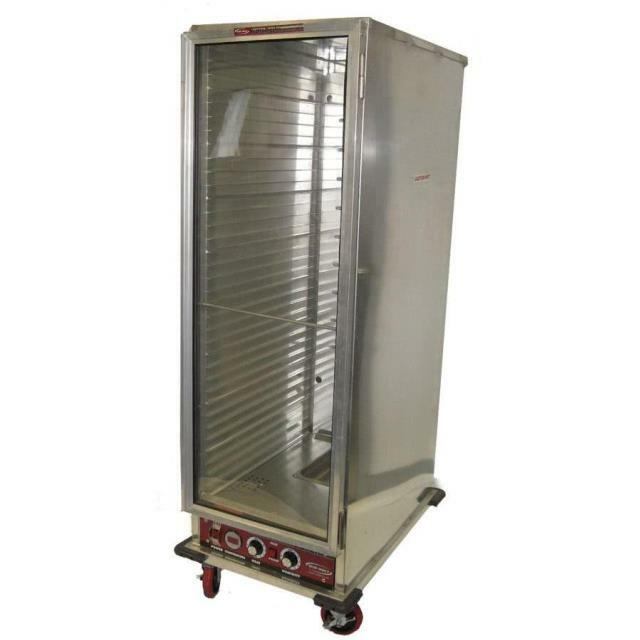 Dimensions: 30 3/4" L. X 21" W. X 68" H.
* Please call us with any questions about our proofing oven rentals in Falmouth MA and Cape Cod.